One of the last steps in the production cycle for most wines is to bottle them into your chosen format which could be a shiner (cleanskin), labelled bottle or into cases. Important: Regardless of the final format we recommend using the Packaging (Bottling) operation to single bottle stock items before using the Manufacture operation to create your cased format. This will give you the most flexibility and save you the most time while ensuring you account for every single bottle you produce. The key component of bottling/packaging/manufacturing is the Bill of Materials associated with a particular stock item. A Bill of Materials (BoM) is a hierarchical structure that defines the component stock items including bulk wine that make up a finished bottle or case. The BoM tells vintrace how to create a single unit of the final product you are making and what dry good stock to use. For example, the following screen shot illustrates how we build the hierarchy of a case BoM (right image) from the single bottle (left image). The bottle and the case both have a respective BoM with the case including 12 x of the single bottle in it’s BoM. Create all your stock items associated with a bottling. Ensure your stock levels are up to date (those are the items in blue on the left, above). 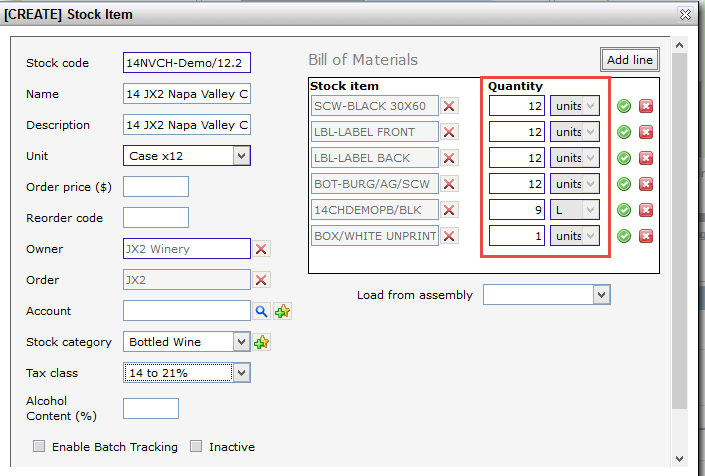 Create your single-bottle stock item (Inventory – New Item – select “Single x 1” for the Stock Type; the stock item for the BoM on the left is “10NVCHDEMO”). Assemble a BoM that includes all components for that single bottle (bottle, closure, capsule, labels and the actual bulk wine). See the Bill of Materials on the left above. For the liquid component (bulk wine), use the volume in a single bottle. For a 750 mL bottle, you’ll use .75L. For the dry goods, you will generally enter one of each. Create your case stock item (x12, x6, x3 as appropriate). Assemble a BoM that includes one single-bottle stock item. When appropriate, add the stock items for the carton, divider or carton/divider combo. See the BoM on the right above. Notice that the components on the BoM are all 12 times the amounts of those on the single-bottle BoM, except the carton – only one is required for a case. Warning: Packaging straight to the case disallows tracking loose bottles that almost always result from a bottling. If your winery doesn’t track these loose bottles, then packaging straight to the case works well for most clients. Note: A BoM can be edited as long as you haven’t performed a packaging or manufacturing operation using it. The most common case is that you have added an incorrect item to the BoM. Locate the stock item (single bottle or case); “X” out the incorrect item and look up/add the new one. You may also add a line for any item that might have been left off. To continue reading about Packaging, Manufacturing and Bottling, use the links below. Click here for the article on Labeling Cleanskin/Shiners. Click here for the Video on bottling.